A high angle forward flyover of a typical Pennsylvanian residential neighborhood. Pittsburgh suburbs. 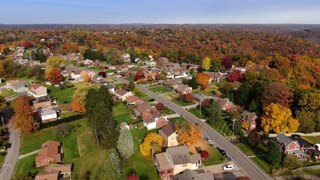 A reverse aerial flyover establishing shot of a typical Pennsylvania residential neighborhood in the late Autumn. Modest homes nestled in Fall foliage below. Pittsburgh suburbs.